In a recent Facebook Q&A session with fans, series producer Eiji Aonuma shed some light on aspects of the upcoming A Link Between Worlds which up until now, have been fairly mysterious. These include the game’s antagonist, Yuga, and the curious Maiamai race, including the item-upgrading character known as Mother Maiamai. In addition to this info, Aonuma also slipped in a small comment regarding Majora’s Mask, presumably to address the recent hype surrounding the possibility of a remake. Hit the jump to find out more. “The name “Yuga” is derived from the Japanese word for oil paintings because he has the ability to use magic to turn people into paintings. We wanted the character concept to be a crazed artist and so we made him into an unusual character where you can’t quite tell if he is supposed to be male or female. He might be close to Ghirahim from Skyward Sword in terms of having an over inflated self-importance”. “She is shrouded in mystery. I don’t actually know myself exactly why she looks like she does. However, as the question mentioned, she exists in both Hyrule and Lorule and we thought it would work well to make her a bit different from other characters since she has this ability to travel between worlds. So we decided to make her look a bit alien. If you rescue all of the Maiamai then you may learn a little more about her so I would encourage you to play and discover this for yourself”. “Oh, one more thing. I see many of you have been asking about a remake of Majora’s Mask for Nintendo 3DS. It’s nice to see such a strong response to this title and we haven’t forgotten about Link’s adventures in that world. If you play A Link Between Worlds, you may better understand what I mean by that”. There is certainly a lot of interesting information to take in here. Although Aonuma drew comparisons between Yuga and Ghirahim in terms of their egoistic personalities, many fans have already drawn links between the two characters in terms of appearence – it is notable that Yuga, much like Ghirahim has a certain androgyny and flamboyant air about him, evident through his overall feminine appearance. On the other hand, Aonuma didn’t reveal much on the Maiamai and Mother Maiamai, as it is evident that the story behind them is something meant to be discovered while progressing through the game. The peculiar Octorok-like appearence of Mother Miamai is no doubt going to serve for an interesting side-story in the game, however. Aonuma’s comments that they haven’t “forgotten about Link’s adventures in that world” are presumably referring to potential Majora’s Mask references hidden in the game, one of which fans have already spotted in a screenshot. While it appears that Aonuma is still remaining decisively tight-lipped about whether an actual remake in in production, it is somewhat comforting to know that they are in their own way, at least, hearing the cries of those who badly wish to revisit Termina. You can read the full Q&A with Aonuma here. But what do you think? Do you think that the connection between Yuga and Ghirahim runs deeper than just their overall design and personality? 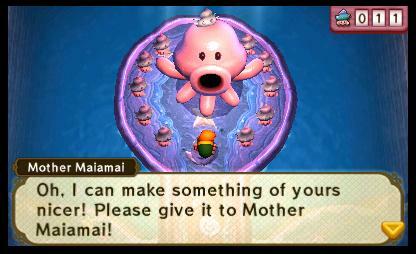 What do you think is the story behind Mother Maiamai and her item-upgrading skills? And do you think after all this teasing, a Majora’s Mask remake will ever come into fruition? Tell us in the comments below.